TOP JOBS! GREAT EMPLOYERS! HUNDREDS OF CANDIDATES! FOR MORE INFORMATION AND A LIST OF EMPLOYERS NEAR EVENT DATE, SEE HTTP://FLORIDAJOBLINK.COM! Our mission is to connect the best and brightest candidates, rgardless of race, religion or any other identification, with great companies seeking top talent! We help our clients staff in all career fields via face to face interviews, streamlining the recruiting process! 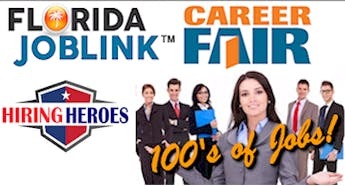 Why attend the Florida JobLink Career Fair? 1) Employers will be offering multiple positions including Sales, Management, Customer Service, Insurance, Education, Government, I.T., Human Resources, Engineering, Blue Collar, Clerical and more. 2) 100% free for job seekers to attend. 3) Career and resume services are available at the event! Employers: Give us a call at (813) 892-5502! Limited Space Available! *Mark your Calendar and Register for the event!